Malta has ranked ninth in an analysis of citizenship by investment programmes conducted by an international research group of 12 countries, with the country among the top three for due diligence procedures. Cyprus and Malta also emerged as two of the most popular jurisdictions for EU and non-EU nationals in the Citizenship by Investment Index, published by Financial Timesgroup’s Professional Wealth Management. The index rated the 12 countries according to seven indicators: freedom of movement, standard of living, minimum investment outlay, mandatory travel or residence, ease of processing, citizenship timeline, and due diligence. the report noted the corruption claims about proceeds from Malta’s programme. Having received a commendable score for ease of processing, Malta was, however, among the lowest-scoring nations for all other pillars, ending up in 9th place out of the 12 countries. Cost differentials between the countries were also described as large: “Among those jurisdictions carrying out the most intense due diligence, Malta, offering the lure of EU membership for wealthy investors, requires a particularly high €1.2m ($1.35m) outlay, compared to $250,000 in St Kitts and Nevis and $100,000 for Dominica,” the report said. 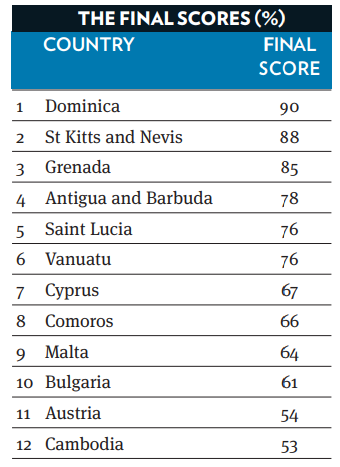 The Caribbean jurisdictions ranked in the CBI Index’s top five positions, with Dominica – home to one of the longest-running citizenship by investment programmes, and known for its speedy procedures and affordable entry thresholds – attaining the highest ranking. The world’s earliest CBI programme was launched in 1984 by Saint Kitts and Nevis, a Caribbean island-state. CBI is attracting investment from families – with Russian, Chinese and Middle-Eastern business people some of the most likely applicants. Around 60 per cent of all applicants for a Maltese passport come from Russia, according to the research.